Identification of bird species involved in bird/aircraft strikes is an important part of the overall assessment and management of this complex issue. Knowing the exact species provides guidance to the size, behavior, and ecology of the bird in question and is key to tracking species trends as well as focusing preventative measures. Species identifications provide the baseline data needed to plan habitat management on airfields, build avoidance programs, and have even been used to assist engineers to design windscreens and engines that are more resilient to birdstrike events. Reporting every wildlife strike is crucial to the continuing effort of birdstrike prevention. Equally important is to assign an accurate species to each case so the overall data is complete and can be correctly interpreted. Although commercial aviation currently reports about 7,500 strikes per year (Wildlife Strikes to Civil Aircraft in the United States 1990 - 2008, Dolbeer et al. ), very few of these cases are associated with a specific identification of the wildlife involved. 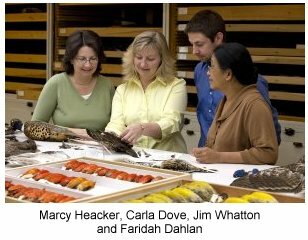 This article presents an overview of the identification methods used by the Smithsonian Institution's Feather Identification Lab - as well as links and recommendations for reporting, collecting, and shipping birdstrike material. 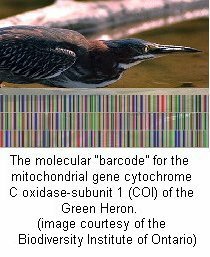 Based on the work of Roxie Laybourne, the SI Feather ID Lab is a highly specialized lab that currently process over 3,000 cases a year for bird species identification from whole and fragmentary feather material. Funding for the lab is supported by interagency agreements between the Smithsonian Institution, U.S. Air Force, U.S. Navy, and the Federal Aviation Administration. The lab is housed in one of the world's best museum collections of birds at the National Museum of Natural History in Washington, DC. This comprehensive collection is ideal for the work done today by researchers Carla Dove (program manager), Marcy Heacker (research assistant), Faridah Dahlan (genetics specialist), and Jim Whatton (research assistant). 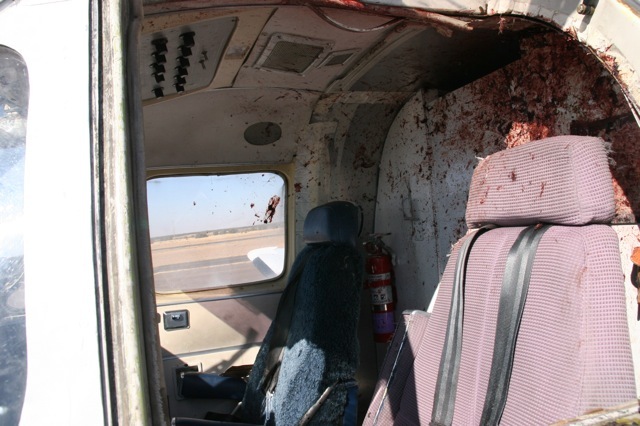 While each case is different, we approach the identification of birdstrike remains based on what kind of material is available. If there is a whole bird or partial carcass, identifications can be based on physical characters traditionally used when viewing birds in the wild - including size, color, and pattern. Wings, feathers, feet, and beaks can then be compared with the bird specimens in the SI museum collection to make a final identification. 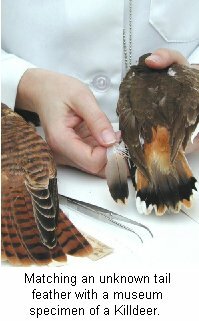 This approach is also applied when samples only include loose or fragmented feathers. 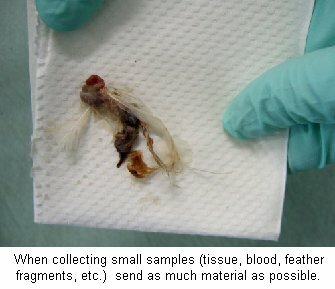 Often there is very little material recovered from a birdstrike. 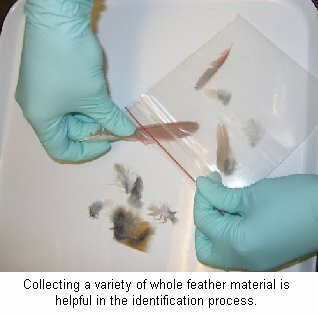 Identification of samples consisting of small feather fragments, blood, and/or tissue can be examined in a couple of ways. 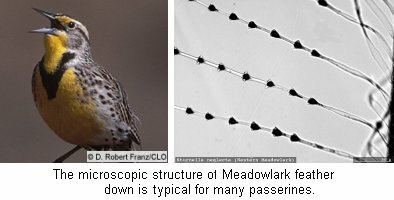 The microscopic features of the downy part of a feather are unique for different groups of birds (ex. duck, raptor, or passerine). Looking at this fluffy area of the feather can provide valuable clues to narrowing down the species identification. Many times samples are examined using more than one of these ID methods. The combination of examination results, reference comparison, and consideration of the case details (such as date and location) leads us to the most confident species identification possible. 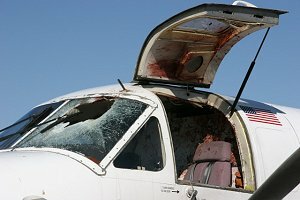 Because the type of remains is never the same, the best way to approach collecting birdstrike remains depends on what kind of material is available. The following is a breakdown of how to collect material for species identification for each of these types of remains. WHOLE / PARTIAL BIRD: Many times, a whole bird is found on the airfield. In these cases, pluck a variety of feathers (breast, back, wing, and tail) and place in a re-sealable plastic bag. The remaining carcass can be properly discarded. Feet, whole wings, or beaks can also be helpful if they can be removed from the whole carcass. If only part of the bird is available, collect the best variety of feathers possible; particularly feathers with obvious color or pattern. If the remains are moist or fleshy, allow them to dry and wrap them in paper before placing in re-sealable plastic bag and/or double bag them. Tyvek ® mailing envelopes also work well. Similar to feather fragment material, the best thing to do for a blood smear or tissue ("snarge") is to send ALL of the material. Paper towels, gauze pads, alcohol wipes work well for collecting this type of material. If the area is dry it is best to moisten the material with a spray of 70% alcohol. Again, place everything in a re-sealable plastic bag to ship to the lab. Our DNA work has found that dry material or material soaked in alcohol give the best results - water encourages nasty molds and fungus that degrade DNA. If you routinely send blood/tissue swipes, you may want to contact the Feather Lab to see if FTA ® dna collecting cards are a good option for you. When sending birdstrike remains to the lab for identification, please include a completed FAA 5200-7 form and contact information. There are two options for shipment of birdstrike remains regular US postal service and overnight/priority shipping. If a case is damaging or priority, we recommend overnight shipping. It is important to securely package the material and use the correct address. Shipments can be labeled "safety investigation material". If you are sending material from outside the U.S. please contact the Feather ID Lab for special treatment and shipping requirements. Proper reporting is a very important step in the overall process of birdstrike identification. Complete and accurate case reports not only make the identification and notification process more efficient, but are also the basis of gathering data, interpreting results, and ultimately implementing the knowledge obtained from the birdstrike reporting process. Your reports and IDs count! @Copyright 2019 Embry-Riddle Aeronautical University. All rights reserved.